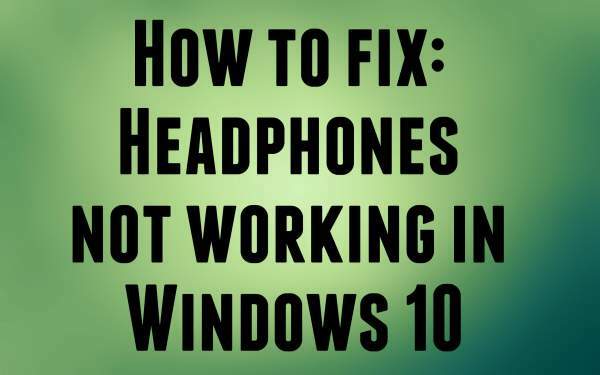 Here’s how to fix headphones not working (no sound / audio) in Windows 10. It seems that every update of Win10 comes up with errors and malfunctions appearing out of seemingly nowhere designed to drive you up-the-wall and around-the-bend. And surprisingly you never know what kind of problem is going to effect and from which part of the system it’s going to affect. Most of the times when you plug in the headphone device, it may not be set as the default device automatically, due to which you will not be able to hear the audio from the headphone. Therefore, whenever you plug in the headphone, first check the default settings, if it’s not the default device then set the above function manually. Press Windows Logo Key + X on the keyboard at the same time. Click on Control Panel in the pop-up menu. Select Hardware & Sound after changing to view by Category option. Select Headphones and click the Set default button at the bottom.In some cases, there is no headphone option alone but Speakers/Headphone. If that’s your case, select that and click Set default button at the bottom. If this solution doesn’t, then proceed to solution 2. Another major cause of this problem is the audio driver. Drivers have been creating issues for ages. So, you may want to consider updating the respective driver. Here are the steps to update manually. And then select Let me pick from a list of device drivers on my computer. Select High Definition Audio Device, click Next, Click yes to the warning. It should work at this point. Restart your computer and check for headphone. If not then go to method 3. Sometimes incorrect configuration in Realtek HD Audio Manager may result in headphone no audio issue. Just go through it quickly to verify the settings. Note: This works only when you have installed Realtek HD Audio Manager with Realtek audio drivers. Double-click Realtek HD Audio Manager to open it. Click the small folder icon in the upper right corner. Make sure to tick the box next to Disable front panel jack detection. Let’s know if it solves the issue of headphones not working in Windows 10. A number of systems may encounter issues with their IDT High Definition Audio CODEC. This can be fixed with a manual driver update which allows us to choose the sound driver we wish to use. Note: This solution only works when you have installed IDT audio device. Follow the steps to uninstall it. Click on Control Panel in the menu. View by Large icons and click Programs and Features. Uninstall IDT Audio Driver from the program list. Does it resolve the Headphones Not Working in Windows 10 issue? Sometimes, the front panel of headphones doesn’t function properly/efficiently in Windows 10 which ultimately causes the error to pop up. It happens due to either one of the reasons – immobilization of front panel or the 0xc00d36c4 error which playing music. Follow the steps to eliminate the issue. Type in Control Panel and hit the Enter button. Inside the Control Panel, go to Hardware and Sound option. Click on Realtek HD Audio Manager. Click on the Disable Front Jack Panel Detection under the Connector settings. Note: this method to resolve Headphones Not Working in Windows 10 is useful only for systems having Realtek HD Audio Manager. You can try the most basic solution to the majority of the pc problems. Switch off the pc and restart it and check if the problem is solved or not. You can do it by following one of the two methods listed below. Press Windows Key + X at the same time -> in the power user menu (inside ShutDown and Sign Out), select Restart. Henceforth you can resolve the audio problem in the windows 10 with the help of above-mentioned solutions. Hope, your headphones not working in windows 10 gets solved by now. Stay tuned to TheReporterTimes for more Windows Errors and their fixes and how to stuff.